Our last posting was via the single sideband radio. It was a communication I did not want to make. We had turned tail and were running back towards shore, aborting our long planned trip to Hawaii. It was a low moment. Sigh! I’ll let that settle in for a moment and you can express your sympathy with us seeing how time and time again we’ve been assaulted with bad luck, unexpected expenditures, barking dogs, unrelenting heat, devious swindlers, and rotten fruit. Whew! Ok, now that the pity party is done let’s get on with the happy reality of life. Connie and I are presently anchored in La Paz. We have ice in the cooler and a fresh chicken marinating in BBQ sauce ready for the grill. It’s a sweet 80 degrees with a light breeze coming across the bay. We are eating cashews and drinking cold beverages. Life is good. Now I’ll fill you in on what has gone down with us in the last ten days. 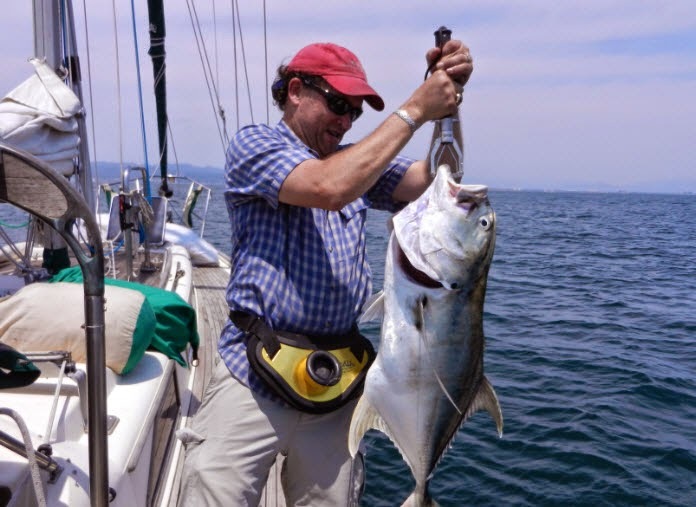 We left Punta de Mita, the last anchorage outside of Banderas Bay on Thursday the 9th of April and we headed out into the open ocean in company with the sailing vessel Papillon, destination Hawaii. Connie found the cheap rum and we poured four cups out, three for us and one for the Old Man Sea. We played tag with Papillon throughout the day and into the night. The wind was on the nose so we had to veer off to the south or north to keep wind in the sails. 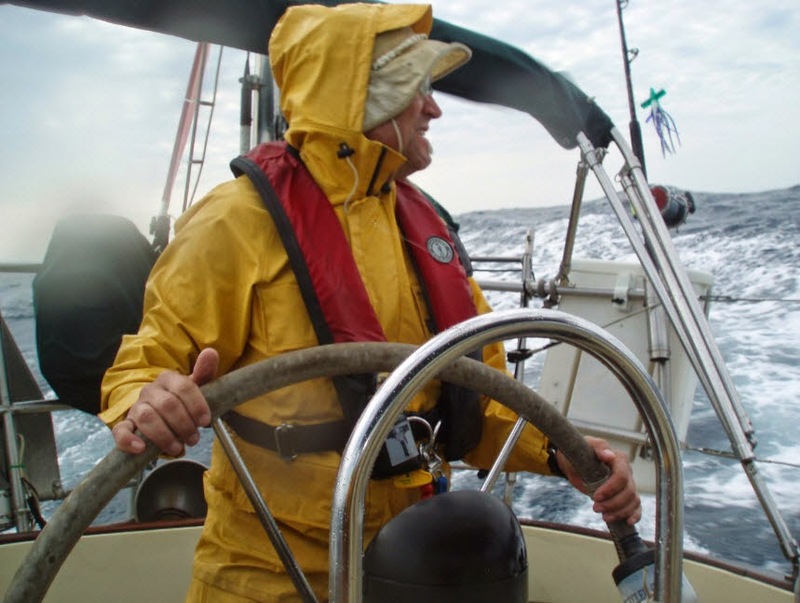 On Friday we motored some then got into rough seas. Connie was feeling sea sick and had retired to her bunk. By mid-morning we had run 80 miles from land. Connie told me she smelled diesel so I pulled up a floor board and found a trickle coming from the stern of the vessel running down into the bilge. The smell permeated the boat. Scott Tobiason removed everything from the starboard cockpit locker and jumped down there to check out the tank. We found a rusted place next to the filler that had broken loose and the top edge of the tank felt spongy. Fuel sloshed up by the violent motion of the boat was seeping out the crack, running down between the two tanks and ending up in the bilge. Papillon was there just off our Port bow, water streaming off her decks. We had a decision to make and as far as I could see we had four options: try a repair at sea, drain the tank, turn back, or do nothing. Doing nothing would be crazy. Repairing the tank would be difficult because once we scraped away the fiberglass and exposed the crack we might cause more damage and create a bigger hole and have even more diesel in the bilge. Keep in mind that the boat had a vigorous motion going and Connie was seasick from the fumes and motion. Draining the tank would be possible but since both tanks are connected, we’d have to pump out 120 gallons of diesel into the deep blue pristine sea. My hand pump is pretty small and it would take a long time to empty the tanks. With no fuel we would lose the option to motor in calms or into the harbor at the trip’s end. Wherever we ended up we’d need to replace the tanks and the fact of it is that replacing the tanks would be less expensive in Mexico. Reluctantly, I decided to turn back. We hailed Papillon and apprised them of our circumstances then we tacked around and headed north towards the cape. We chose to seek landfall at the cape instead of going back to Banderas Bay. It was somewhat an equal distance and there was just something too “tail between our legs” about going back from whence we left. We tried to thread the needle but no such luck. North we went and into the night watching the wind veer around until it was right on our nose. Later that night I downloaded a grib (wind vector) file on the radio and it showed some strong winds to the north of us but the winds looked to be of short duration and there was a weak gap between the two peaks that I hoped we’d hit. We motored until nightfall then continued on under sail, changing course towards the east as we got headed. Saturday we continued north and east, motoring to reduce the amount of diesel in the tanks. Late Saturday night the wind piped up and the seas built to four feet. We put one reef in the main and rolled the jib up halfway and continued on. In the early morning hours it got rougher. Connie awoke with the commotion and prepared for her watch finding it had been commandeered, yet happily acquiesced at the sight of the sea conditions. She mentioned the possibility of there being too much canvas up seeing as we were heeling hard to port. She moved out onto the settee and turned on the fan to reduce the diesel smell. Wedged into the master berth, I got a few winks of sleep but gave up at about 03:00 when I joined Scott Tobiason on deck. 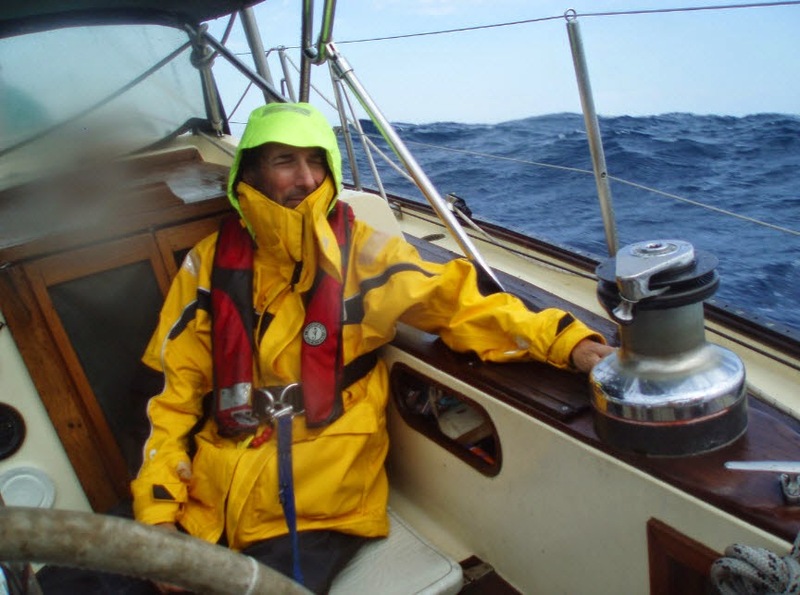 The seas were heaving roughly and the wind increased as we cracked off on a starboard tack. Earlier I had observed that the first reef line was in the lower leech cringle and didn’t pull the sail down far enough for the reef points to tie properly. 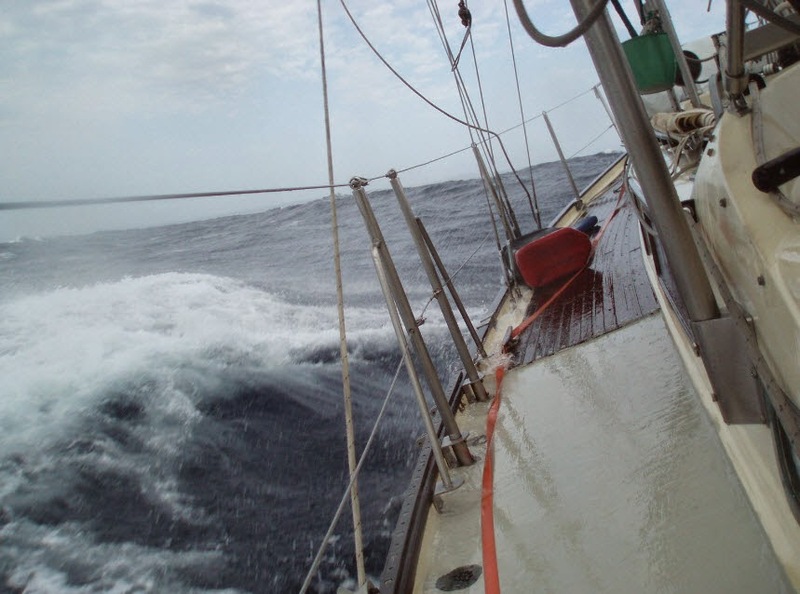 Sure enough, with heavy wind on the sail, the reef points started to tear the main sail. 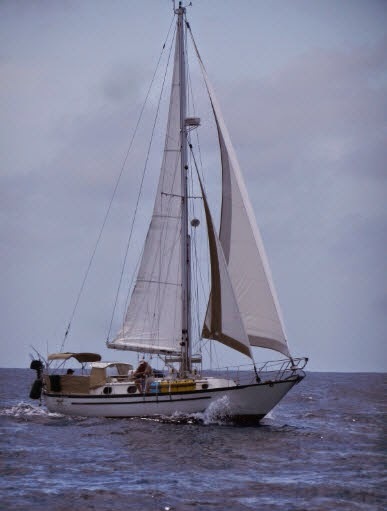 We fought in the Genoa some more by putting the haul line on the winch, all the time wishing we’d completely furled it earlier and set the sturdy staysail, but the sail was brand new and holding up just fine with the little bit we had out. Our main worry was the main. 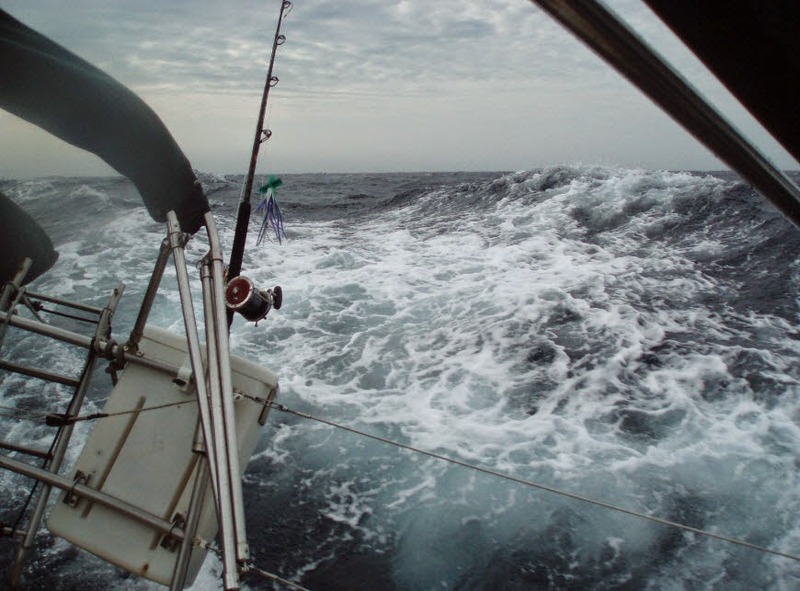 It was so rough we were hesitant to go on top deck to tuck in the second reef but finally I decided it had to be done or we’d lose the main as the points were ripping out more so each hour. Actually it turned out to be pretty easy to put the second reef in the main. I moved carefully along the side deck then up to the cabin top holding on tightly. At this time the boat was being swept by the seas on a regular basis. Water ran down both sides and cascaded off the leeward side. I remember standing there at the mast, hauling down the sail and getting slapped on my backside by water. It was thrilling. Scott Tobiason and I were shouting to each other over the wind to coordinate the mainsheet, traveler, halyard, and topping lift. It went well and fairly quickly as both of us knew what the procedure was. With the second reef in place the boat was not heeled so severely and the going was much smoother. The leeward rail was less often in the water. The tops of the waves were being swept off by the wind and there was foam all around. Traveler would rise up to meet the big waves, and then she’d just roll right over the top, never losing her momentum. We braced ourselves in the cockpit, taking spray in the face and marveling on the beauty of it all. Down below the water was coming in, forced through the hatch gaskets. Our bed was soaked and the settee was wet. Feeling better now yet marveling on the terror of it all, Connie fought her way out of the wet settee and while trying to dog down the hatch more tightly she got lifted up into the air and tossed over the table and across the cabin, landing safely back in the settee. She decided that if we needed her we’d holler but it was best to stay put. The two Scotts stayed wedged in the cockpit as Traveler barreled her way north towards the cape. We kept saying, “I think it is moderating now.” It was a wishful thought. Into the day we hurled, the underdeck autopilot keeping us on track. 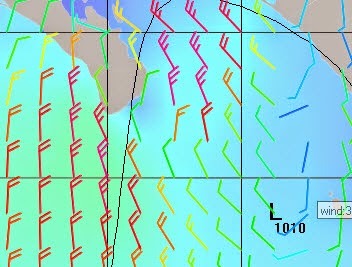 Finally we saw land ahead and by 11:00 we were running down the southern Baja coast with the wind and rollers behind us. With the changed motion of the boat, Connie happily came on deck and enjoyed hand steering down the waves wing on wing as we made our way into San Jose del Cabo and the protected breakwater there. At the dock we took stock of our situation, broke out the rum, and grabbed at anything easy to eat. The boat and her crew were soaked and salty inside and out. The forward cabin door frame was canted out a couple of inches. Most of the fruit and vegetables were bruised. There was diesel in the bilge. We set about washing bedding and clothing and drying everything out. Lowering the sails we got out the fresh water hose and rinsed them starting from the top, raising and rinsing until they were wet with fresh water. 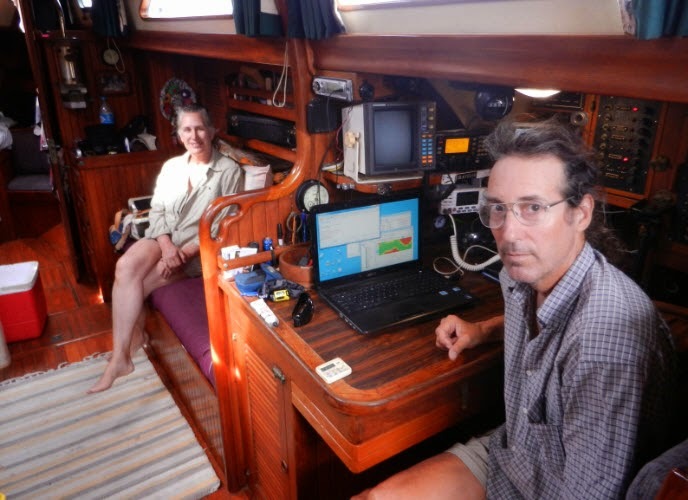 We rinsed and wiped the cabin, sides, stainless, running and standing rigging. Inside we wiped the walls, ceiling, and floors. Traveler soon looked like a gypsy boat with towels, cushions, and clothing hanging from lifelines and ropes led fore and aft. The folks from the sailing vessel Tillicum stopped by. They were headed for Hawaii also but turned back because of a steering problem. We heard on the radio about a catamaran named Papokee who also turned back with a broken water pump. So that’s three boats that left for Hawaii and came back. Hopefully our friends on Papillon continued. At the fuel dock in San Juan del Cabo we met our friends on Del Viento filling their water tanks, a last stop this side of the Pacific. We waved them off the dock as they started their journey to the Marquesas. The next day we visited the port captain who listened to our story and allowed us back into the country, advising us to check in when we got to La Paz and then go to the immigration office to get our visas straightened out. Now that the main sail was clean and dry, we removed it and spent the afternoon with the sewing machine patching the torn reefing points. With internet and phone coverage we set about making new plans for everyone. Scott Tobiason changed his return flight from Hawaii to Cabo and his wife Karen decided to fly down to join us in La Paz. Connie and I decided to take a break and spend some time cruising the local area with the Tobiasons then we’d just ramble north and take care of the diesel tanks in Guaymas. As long as we didn’t get into rough seas the tank didn’t leak so the urgency to get them replaced right away was lessened. Scott Tobiason at the helm. 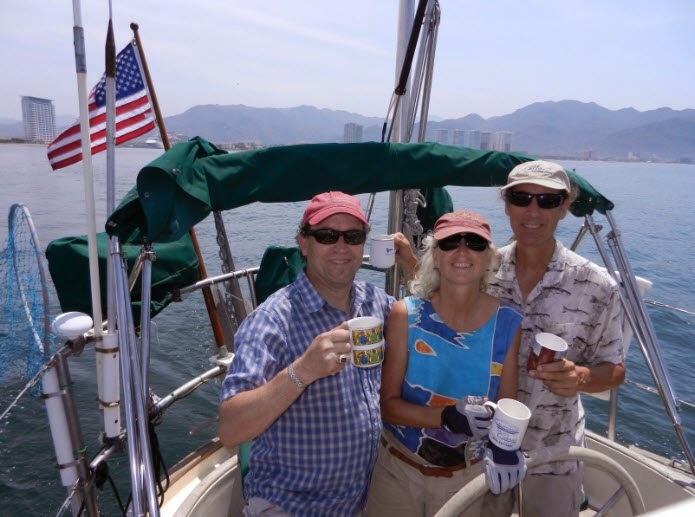 The winds were northerly and light for the next three days so we motored north to Los Frailes then Muertos, then into La Paz where we picked up Karen and checked in with the La Paz port captain. Their office saw no problem with us returning to Mexico and they stamped our papers with a flourish. At Immigration it did not go so well. We had surrendered our visas when we left Puerto Vallarta and the next port was supposed to be in Hawaii. But now we were back and the immigration office didn’t know what to do with us. Legally we should leave, go to the States. Then we could return and get new visas. But since we never went to the United States we were in a sort of limbo world. Finally, after much discussion it was decided that we could write a letter in Spanish saying what happened, take a picture of the GPS track where we turned around in mid-ocean, and copy our log book where we’d made the entry saying we were aborting the trip. After lots of scurrying around madly for a couple of hours and waiting a couple of hours more we finally obtained new visas good for another six months. Yee ha! 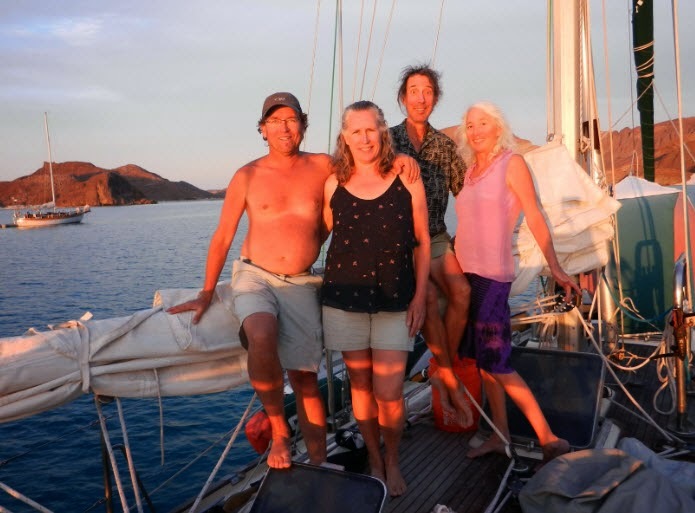 The four of us spent four days cruising the bays of Isla Espirito Santos and Isla Partida. 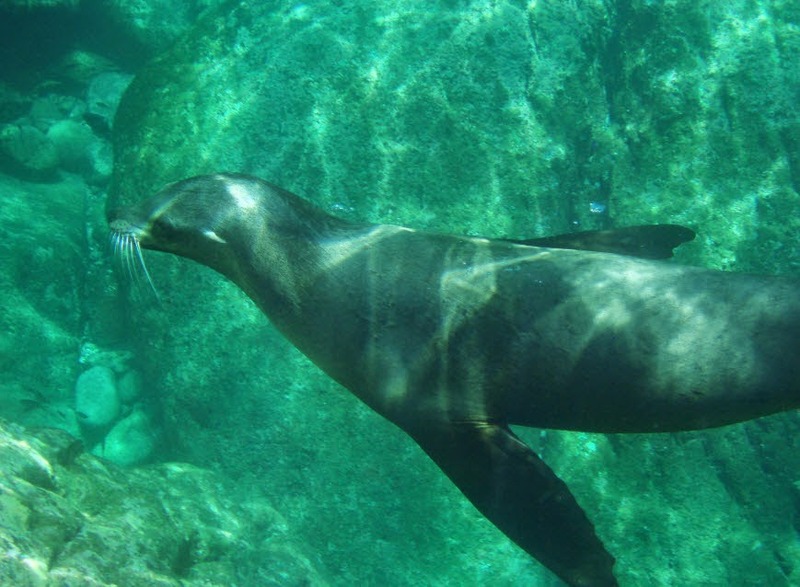 We swam with the sea lions, fished, hiked, and had a marvelous relaxing time. We tried to insert some humor into this post and I hope you got a smile or two out of it. But the truth of the matter is that traveling on the ocean in a small boat is a serious proposition. Every year we hear of someone losing their boat during a crossing. In the Baja Ha Ha 201?? ?, ?? hit a whale, lost her rudder, and the boat sank. The crew took to the life raft and were rescued. Last year a couple with two young children had to abandon their boat when one of the kids had serious health problems. This year already we heard about s/v ?? who had ??? and sank just after another sailboat took them off for safety. For us, erring on the side of caution seems to be the best plan. The next time we go offshore we'll be even more prepared and the boat will be much sounder inside and out. I guess Hawaii will just have to wait. We’ve got some work to do but before we start in on those projects, we’ll take our time heading north and enjoy the wonderful Baja anchorages between here and Guaymas. Thanks for following our story. I hope you are not too disappointed that we aborted our crossing. Todo bien. It’s all good. Hi there, what an adventure! Sounds like the Perfect Storm, but not quite. Your reasoning was sound and shows good decision making. Thanks for all the details, glad Scott Tobiason was there to help. Good guy to have in times like these! Love to you all. You two have the best sense of humor of anyone I know! Bored in port looks sooo good after a little offshore adventure. Let the good times roll!